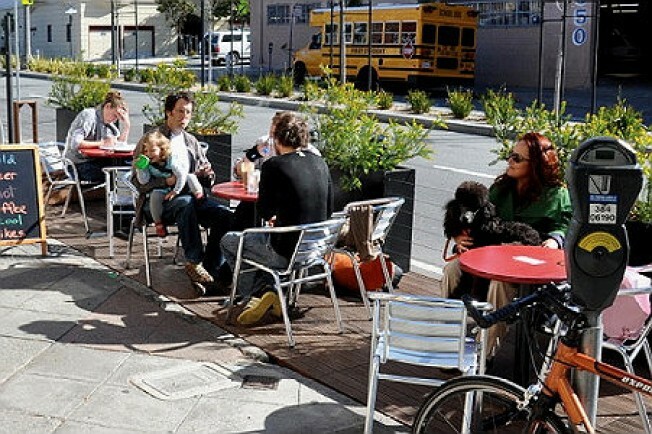 People enjoy a parklet in San Francisco. Parklets and the NIMBY hate they bring are not just for the City anymore. Oakland Local reports that some businesses in Oakland want to install and parklets and some are even willing to pay for them. While there is no formal permitting process like the City, some Oakland businesses are willing to put up cash to get temporary parks established in front of their businesses. Park(ing) Day has become popular in San Francisco with some, while others decry losing parking spaces for a day for temporary parks. Still more than 40 people have applied to the City to put up parklets this year.